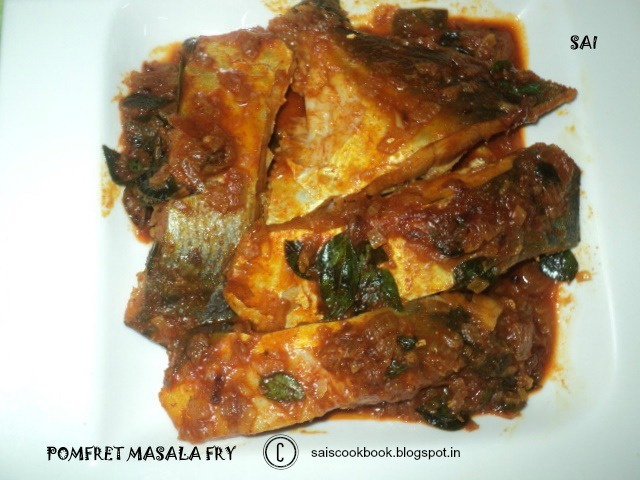 Its been only few days since I posted in the blog but feels very long,since I’m held up with kids exams and other commitments.I had the picture of pomfret masala fry in my folder and had prepared Koddai masala fry recently and the recipe is so very tasty that I thought of sharing here.This recipe was shared to me by my FB friend Laxmi Shenoy. Laxmi and me share the similar taste,yes,we both are Meow’s when it comes to seafood.Thank you Lakshmi for this tasty recipe.This recipe may be prepared with other fish also. Marinate the fish with all ingredients under to be marinated for half an hour. Heat oil in a pan and fry onions until light brown,add curry leaves,marinated masala and fry for sometime. Add the fish with little water(few tbsp’s only if required) and cook the fish on both the sides until done.